Karlsruhe, February 14, 2018. In January 2018, low-pressure systems with partly high wind power generation caused numerous bottlenecks in the German electricity grid. To ensure grid stability, renewable energy plants were temporarily shut down as part of the feed-in management. The latest figures from UBIMET for January 2018 show that curtailments caused by storms “Burglind”, “Friederike” and “Olli” have in some cases clearly exceeded 3 GW. 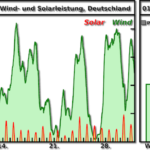 According to preliminary calculations, around 520 GWh had to be curtailed in Germany in January. Interestingly, despite a record wind feed-in of more than 42 GW at the beginning of the month, the EinsMan volumes do not stand out in the annual comparison – the amount of energy which was curtailed in January is comparable to the January average over the last three years. The EinsMan quantities for January 2018 are subject to missing publications and subsequent changes by individual network operators. In addition to the EinsMan Monitor*, in which the current regulations for Germany are extrapolated, UBIMET has the EinsMan Forecast*, a fundamental model which can predict feed-in management measures. *Note: The invention, which forms the basis of the EinsMan Monitor and the EinsMan Forecast, is protected as a utility model (DE 20 2017 100 343.4) and has also been filed for a patent by UBIMET (DE 10 2017 101 265.6). Curtailments as part of the feed-in management from 27. to 29.01.2018 – caused by the storm “Olli”. Gray line: EinsMan amount for Germany. Coloured lines: EinsMan amount of different network operators affected by EinsMan.